Much more than silk was traded along the Silk Roads. All kinds of luxuries and staple goods passed along the shifting network of roads, ocean routes, and desert caravans that linked Asia, Africa, and Europe during the medieval period. Pottery, sometimes a luxury, sometimes a staple, was one of the most commonly traded goods. Chinese potters were among the first to make ceramics with high-temperature kilns, producing a very strong and hard type of pottery called stoneware. 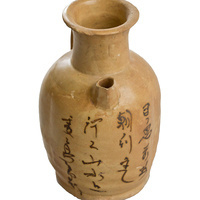 Early in the 7th century CE, dozens of styles of stoneware began flowing from Chinese kilns onto the Silk Roads. This year-long exhibit focuses on a single style of Chinese stoneware: Changsha Ware produced at the Tongguan Kilns in modern-day Hunan Province. Visitors will learn about the creation of stoneware at the kilns, the transportation routes that carried the pottery throughout the world, and the global consumers that bought and used it through vignettes illustrating each of these topics. Admission is free.